Dos Ojos means “two eyes” in Spanish and describes the two circular depressions close together in the jungle known as the east and west eyes. The spectacular semicircular Cenotes are large crystal clear turquoise blue pools that have formed around the edges of the collapse in a lush green jungle setting. Dos Ojos is located 1km south of Xel Ha on Highway 307. From the turnoff a 3km dirt road leads out to the east and West eyes of Dos Ojos 15 min. into the jungle. From the east eye 4 permanent gold lines lead into the Cavern forming 2 completely different routes which both start and end in the east eye both of which can be dived in either direction (clockwise or anticlockwise). Of the 2 cavern lines the Bat Cave line takes you through smaller, darker areas of the Dos Ojos cavern zone and is therefore usually dived second so as to gain confidence during the first dive on the Barbie line. 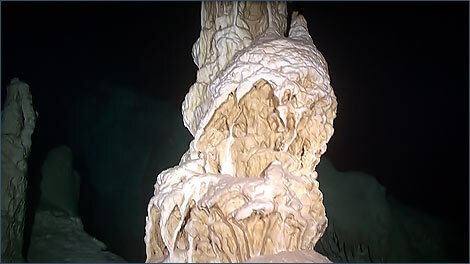 The Bat Cave line is not to be missed though as it is highly decorated with many intricate and delicate speleothems, everywhere you look you will notice new details. The line tours around the outside of the Bat cave a large air filled underground cavern with a solution chimney entrance in the ceiling that lets in light. As the name suggest the Bat Cave is home to many bats that roost high up among the stalactites covering the ceiling which you can see when surfacing there. Nice place to shoot .